According to the recent Delta Dental Oral Health and Well-Being Survey, Americans are taking the necessary steps to address their oral care. Your family dentist in Norwood found these findings to be very interesting. That’s why they’re talking about them in their most recent blog post. Getting a snapshot of the country’s at-home oral care habits only helps dentists like him better understand how to help families improve. That way, he can pass these tips on to you once you come in for your regular visit. Besides showcasing this new data, your dentist wanted to provide a plan your family can take on to improve your oral health. 7 out of 10 Americans brush their teeth twice a day, however, 30 percent aren’t brushing enough. On average, Americans brush their teeth for 1 minute and 52 seconds. 6 out of 10 people also brush after waking up in the morning and right before bed. African Americans and Americans aged 18 to 24 are brushing longer than the total average, about 18 and 16 seconds longer respectively. 91 percent of Americans brush over the sink in the bathroom, while 4 percent brush in the shower and 0.2 percent brush while driving (yikes!) Furthermore, people aged 18 to 44 are twice as likely to brush in the shower. 23 percent of Americans have gone two or more days without brushing in the past year. Nearly 37 percent of Americans aged 18 to 24 have gone two or more days without brushing as well. Only 4 out of 10 Americans floss once a day and 20 percent never floss. Your children’s dentist in Norwood is thrilled to learn that Americans are brushing for longer, but disappointed that they still skip brushing occasionally and don’t floss as often as they should. Even just a day of missed brushing can be detrimental to your oral health and not flossing puts you at higher risk of contracting gum disease. To help your family, create a specific time for all family members to brush in the morning and at night. A great way to prevent people from skipping brushing is to tie a habit they currently have with it. For example, if they’re excited to eat breakfast, make sure they brush their teeth before they’re served. The moment their feet hit the floor and they’re out of bed, have brushing become part of their process for waking up. To make flossing easier, purchase handheld floss picks that make reaching the hard-to-reach areas easier. To save money on floss, buy a large roll in bulk and use a handheld floss holder in tandem. This way you won’t need to use the recommended 18 to 24 inches or wrap floss around your fingers. All that matters is you scrape the sides of teeth that brushing typically misses at least once a day. Want additional tips to make brushing easier for your family? 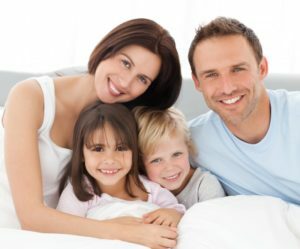 Schedule an appointment with your family dentist in Norwood today to learn more! Dr. John T. Michaels earned his Doctor of Dental Surgery degree from the Ohio State University Dental School. Since then, he’s obtained over 1000 hours of advanced education in cosmetics, implants, endodontics, periodontics, and orthodontics. This allows him to provide the Norwood community the highest quality dental care possible. To learn more about his preventive care treatments and practice, contact him at (781) 769-6140 or visit his website.